He does more however then just score on the offensive end, as he is a good passer, especially for a shooting guard/off guard. He keeps his eyes up when on the perimeter and even hit the roll man on the P/R. Also showed the ability to thread the needle in the half court set and had several quick hitters that eventually led to scores. He has more assists then turnovers on the year with a 1.5 assist to turnover ration. He is even-keeled on the court and he doesn’t show much emotion and any attitude. Got taken out several times because of poor shots and didn’t show any attitude when coming out. He has a lot of confidence in his game and his ability to score and is not afraid to let it go- has confidence in his game. Defensively, he has quick hands and he plays the passing lanes very well. He is averaging over two steals a game 7 games into the season. He had several steals this game. After showing average defense in the first half, he came out and defended better in the second half. Has the physical tools to be an excellent defender w/ good size for a combo guard and superb athleticism. Though Glover is an excellent scorer, he forced several shots this game and didn’t show much discipline in his shot selection. He settled for contested perimeter shots early in the shot clock, a shot he could get any time. Five games into the season he was shooting just 37% from the field, a number that should be in the mid to high 40’s with his scoring and athletic abilities. I believe this number is low because of him forcing some shots. 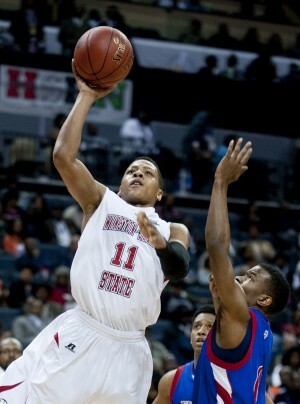 His jump shot looks inconsistent as well, even though he did lead Winston-Salem State in three pointers last season. He went 1-4 from distance tonight. His shot is a little flat and his right elbow sticks out to a degree. He tends to miss short when he does miss and he showed a low release at the FT line. He does get shot off very quickly, minimizing the effect of his low release point. Even though he is a good passer, most of the time when he drives he puts his head down and does not intend to pass. When he drives and attacks he does so to score not to make plays for teammates (not necessarily a bad thing, because he is asked to score, but could pose trouble at next level). Defensively he is excellent at forcing turnovers and steals but he didn’t seem to show or put in the same effort on the defensive end play after play like he did on the offensive end. He tends to gamble and reach too much on the perimeter and doesn’t bump the cutters. He is slow laterally and players went around him several times. Has hands down too much defensively and didn’t contest several shots. shooting over 36% from three and over 76% from the FT line. Before arriving at Winston-Salem State he was a 1st Team All-American at Davidson County Community College and is the All-Time leading scorer at the school. Was All-Conference last year after leading the Rams in scoring as a junior and helped them win the CIAA Conference Championship. Having said all of that, the fact is, is that combo guard scorers (especially players 6’5” and under) are a dime a dozen and pro teams have no shortage to pick from. However, I do believe Glover has the skills and abilities to play professionally next season. He would be a good candidate for a D-League team to invite to their training camp and see how he performs at that stage. He would probably be better off and will probably end up playing overseas for a 2nd division team in Europe. European teams love athletic, high scoring guards from America, especially ones who can please the crowd with highlights and dunks, which Glover can do with his explosiveness and scoring ability. European teams and select D-League teams should monitor the rest of his season and file his name for future refrence.